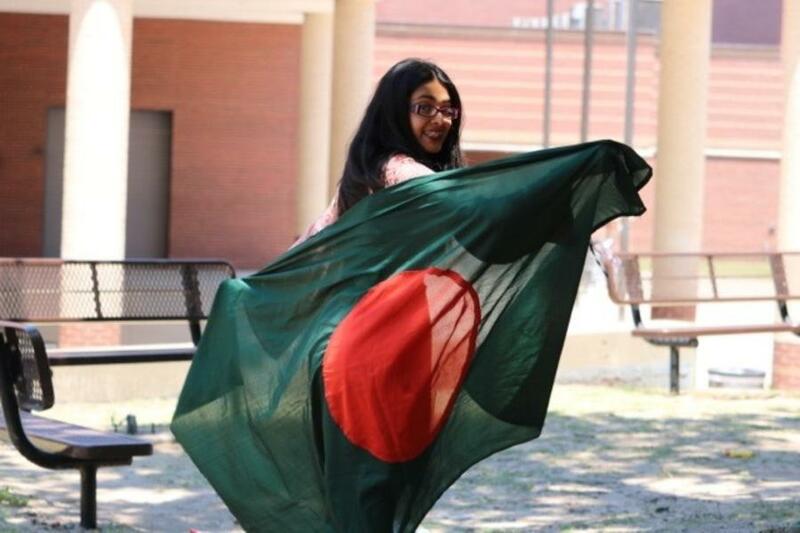 Coppell High School senior Saira Haque holds the national flag of Bangladesh, as she plans to intern at JAAGO Foundation, a nonprofit that helps combat the cycle of poverty through education. Haque plans to travel to Dhaka where the headquarters are located during the summer of next year. Those were almost the exact words I heard more than a year ago from someone at a gathering when I shared that I decided to pursue a career of social and international work. I felt offended and disheartened. I was a carefree and confident 17-year-old with big dreams and aspirations who was brought down by someone else’s negative commentary. However, that did not stifle my dreams. I became more dedicated and passionate in what I wanted to do for the rest of life. I want to give back to those who are not as fortunate as I am. When I speak about my ambitions, I speak with tenderness and passion knowing that I will be a very successful yet a very humble person by being a part of this rare yet noble career. My interest of international service and social work blossomed the summer before my freshmen year when I saw brief trailer of the award winning documentary “Girls Rising” where they showed a scene of an 11-year-old young girl getting married off to a much older man. I was disturbed to the core and my blood started to boil with anger as soon I found out that girls are taken out of school to be sent off with random strangers in order to fix a dispute between two families or ease the burden of feeding an extra mouth because several of these girls do come in large families. Young boys and girls are forced to go out in the streets to beg for money, work under dangerous and life threatening conditions, or are even sold into prostitution. As I continued my research of different social issues, my eyes were opened and realized how I grateful and privileged I am for everything I have. That is why I want to pursue a career in social work. I grew up listening to stories about kids not being in school learning, domestic abuse, people in slums, etc. Several developing countries do not have access to clean water and sometimes even food, leaving kids malnourished. I hear about teen moms not getting the support they need. Several kids who grow up with alcoholic parents are often grow up following the same patterns of verbal and physical abuse. This breaks my heart and leaves me in tears. I have always had a love for helping and making a difference in people’s lives. When I found out that social work is career that I can pursue, I was ecstatic. My heart was filled with excitement. Since then, pursuing a career in social work has been something I have been dedicated to since I was a young and carefree freshmen in high school. I want to find a way to give back for all the times I have been provided with love and endless opportunities because everyone deserves to have a purpose in life. That is why I am pursuing a career of international and social work and I honestly cannot wait. Somewhere in the distance future, I want to start my own nonprofit that helps teen moms without support find a safe haven. When most people think about adolescent pregnancy, they only think about the negatives: dropping out of high school, depending on government care, single-motherhood and promiscuity, which often leads to victim blaming. Instead of thinking about the negatives it is our job to provide a safe environment and help teen moms get back on their two feet after pregnancy and encourage them to continue their education and help create short and long term goals. I want to travel the world and educate on the dangers of child marriage, sexual exploitation and child labor. I want provide to those who are survivors of these inhumane treatments by providing safe homes and finding every way possible to ensure that these people are back on their two feet ready to face the world. When I shared the decision of pursuing a career of social and international work, my parents were ecstatic knowing that I will make a difference so many people lives and make a huge contribution to society. And of course,I have dealt with a number of criticisms which has lead to lots of tears being shed to the point where I wanted to change my career path so I wouldn’t deal with the constant negativity. But the criticism and the negative commentary has not stopped me from pursuing what I want to do for the rest of my life. I have seen social workers and the difference they make in so many lives, sometimes saving thousands, is amazing. wish you luck in your noble career!